Tiger hills get insanely crowded in the morning hours with tourists to get a majestic glimpse of Mt. Everest and Kanchenjunga peaks altogether at sunrise. 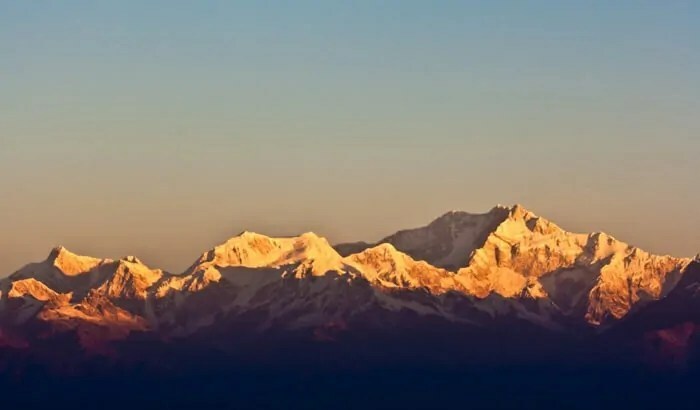 It is in Darjeeling, West Bengal and is 11 kms south of Darjeeling above Ghoom. Being a summit of Ghoom, view of sunrise from this point is panoramic. One of the major tourist attractions in Darjeeling is the sunrise point at tiger hills. Just before the sunrise, sky changes its color to a beautiful shade of crimson. Gradually, peaks of Kanchenjunga will start playing hide and seek. One clear glance at the peaks, when sunshine falls on it is ,incredible breathtaking. If weather is clear, 250 km stretch of Himalayan horizon, including Everest, Lhotse, and Makalu to the far west can be easily seen. Also, to have this spectacular view, weather should be clear. If you are lucky enough, then you might get the opportunity to watch it at first attempt itself. Otherwise, it’s worth trying for multiple times. Flocks of tourist vehicles, drive early morning around 5 am to 6 am towards tiger hills and makes it heavily crowded. Taxis to the spot can easily be booked in advance or from the taxi stands. Image credits: Internet search with due credits to the owner. ← Ziro Valley, Arunachal Pradesh : Paradise for seekers of peace! !